So I mentioned that a couple of weekends ago I was helping out with some craftiness at my church. 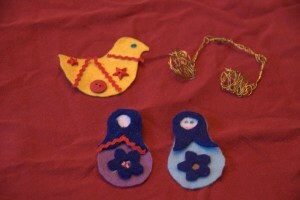 I had organized two crafts: felt ornaments , which we’ve done before, and wire-wrapped ornaments. 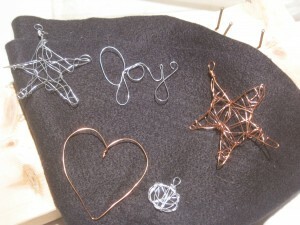 I got the idea for a wire-wrapped star from this Family Fun how-to, but it was not as easy as it appeared. Basically, I was supposed to wrap 18-gauge wire around a star cookie cutter, and then kids could use lighter-weight wire to wrap around the star and make it pretty. 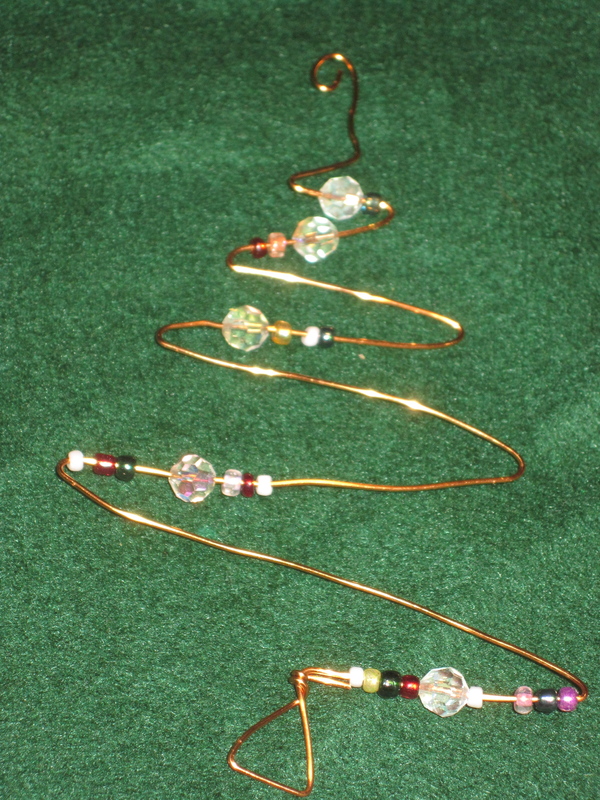 Wrapping the wire was a pain in the neck, especially since I wanted to make a bunch for lots of kids to do. Cute W helped by putting some nails into a board, which made wrapping a bit easier, but it was still labor-intensive, and the stars weren’t too pretty. Of course, I was figuring all this out the night before the event. Ugh. For me, the 22-gauge wire was great for just tooling around with shapes, but it probably wouldn’t have been able to have another wire wrap around it–you’d need a thicker “base wire” for that. It was fun to just play around with it. Like, that little silver shape next to the heart seemed like a pendant for a necklace that I might buy. M made the musical note with craft wire, and the bird and matryoshka dolls are made from cut-outs that I’d prepped for the crafting event. They came from this unbelievably adorable book, Fa La La La Felt, which will make you yearn to craft immediately. Many of the crafts are ambitious, but luckily, they can be taken down a notch to accommodate the patience and skills of children. And/or this blogger. In fact, I feel a bit guilty, because in the book there are these bee-you-tee-ful matryoshka ornaments that are sewn together with a little batting to give them body, and I did a modified version, and then my kids stole the pieces and modified them some more. Same deal with the bird: in the book, it was a lovely dove with a coordinating floral-patterned wing piece that I’d planned to make, but one of the kids just had a rick-rack and button party all over it. So these are cute, but the ones in the book are gorgeous. And absolutely do-able, just not do-able for me right now when I’m also working on Christmas shopping and helping kids with homework and keeping up with the blog. I was sad that there wasn’t one of those “Look Inside!” options so that you could see the Many Splendid Crafts in the book, so I poked around a bit and located the author’s blog, which is going into my Google Reader. 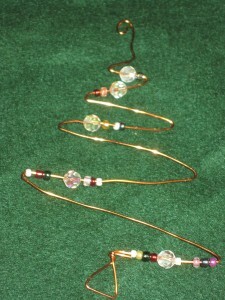 The wire crafts are going to be part of this year’s Crafty Girl Party. The book is on my Christmas list (hint, hint). What a super cool idea. I LOVE LOVE LOVE the Crafty Girl Party. Wish I was there or maybe, that some lovely crafty girl will make a matryoshka doll for her dear old auntie. Monday the 19th from 3 to 5 pm! So worth the drive. Well, maybe. I’ll try to get them on that matryoshka doll for sure, though. I’m just a little slow on the up-take, apparently. I was buzzing through FB, checking on updates, when I came across your CD Fun posting and saw the picture. My first reaction was, “Wow, that looks just like the thing I made at church!” LOL Thanks for being such a super host! Christine–see, so gorgeous that it’s blog-worthy! I even went out and got some beads so that we can make more just like your design! Thanks for the inspiration!